Currently viewing the tag: "Navy Strategy for Achieving Information Dominance"
Navy Strategy for Achieving Information Dominance 2013-2017: Optimizing Navy’s Primacy in the Maritime and Information Domains. 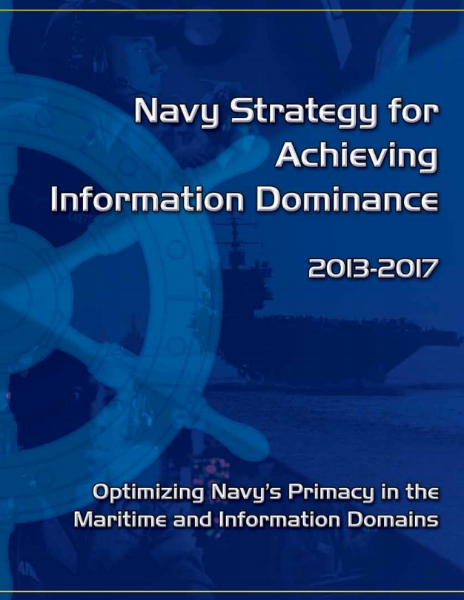 Cosigned by Vice Admiral Card (Deputy Chief of Naval Operations for Information Dominance) and Vice Admiral Rogers (Commander Fleet Cyber Command; Commander Tenth Fleet) this strategy document lays out the Navy Strategy for Achieving Information Dominance. First and foremost Information Dominance is defined as the operational advantage gained from fully integrating the Navy’s information functions, capabilities and resources to optimize decision making and maximize warfighting effects (cyber warfare). Information Dominance as a Warfighting Discipline. In support of this Navy Strategy for Achieving Information Dominance, the related supporting documents include: the Navy Information Dominance Roadmap, 2013-2028; the Navy IDC Human Capital Strategy, 2012-2017; Navy Cyber Power 2020; the Naval Intelligence Strategy, 2013-2020; and, the 2013 Navy Space Strategy. Within this integrated framework, the Navy begins in earnest the process of marshaling its resources, galvanizing the workforce, and aligning Navy’s Information Dominance capabilities to fully enable the Navy’s primary tenet of Warfighting First.